BSNL Diwali Laxmi Offer, BSNL Free Balance Offer, BSNL Full Talk Time Data Offer, BSNL Best Recharge Offer, BSNL Online Recharge offer , BSNL Diwali Recharge Offer – Hello Readers, Hope you are well and enjoying our free recharge tricks and new free recharge apps. 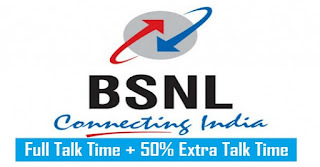 Now we are with BSNL Offer where yo will get full Talktime with 50% Extra Balance for all users. This Diwali BSNL has come up full talktime offer with extra talktime, in this diwali offer they are offering Full Talktime for all + 50% Extra balance on every top-up of Rs 290, Rs 390, Rs 590. This Offer on BSNL Diwali Laxmi Offer is valid only from 16th October to 21st October 2017. So Hurry up guys and avail this offer no if you wanna more benefits with BSNL. How to Get Full Talktime On BSNL With 50% Extra Balance? 2) Now initiate a new Recharge of Rs 290, Rs 390, Rs 590. That’s all, You will get the Full Talktime On BSNL + Extra 50% More Balance on your main balance account. You can also activate the Rs 429 Plan with this Balance to Get Unlimited All network calls + 1Gb Data per day for 90 Days. Dail 444*429# to activate.